He is a wonderful dog! We are so happy with him! He’s very smart, picks things up very quickly and, of course, is beyond adorable! We go to the park 2 or 3 times a week and walk with a friend and her dog. Also got him in the lake today and he actually got to swim. 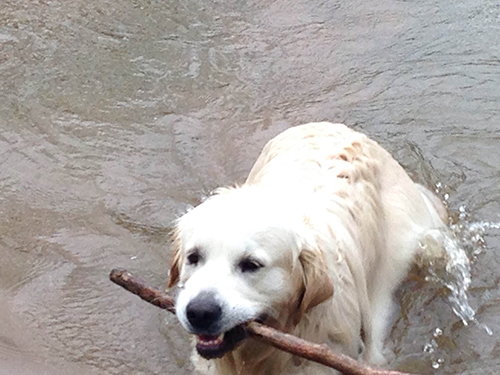 Up til now he merely waded in–but throwing a stick did the trick–he had to retrieve it!! Once a week he goes to doggy day care and plays with their 7 Labradors and any other dogs that may be there at the time. I want to be sure he gets properly socialized. He still goes to work with us every day. We are planning on enrolling him in obedience classes very soon–although he has done very well with all training that we’ve already done with him. I’m afraid he is very spoiled! He learned very early where the food comes from–if I’m in the kitchen cooking he is right beside me. In addition to his Blue Buffalo dog food he usually gets some chicken, fish or steak–depending on what we are having for dinner. Please know he is well loved! You have bred and raised a wonderful puppy! 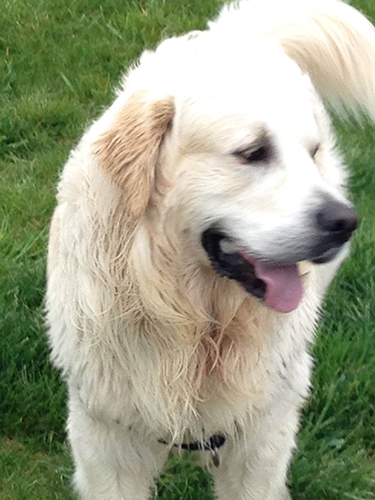 We would highly recommend your kennel to anyone interested in an English Cream Golden. Bailey is doing very well! 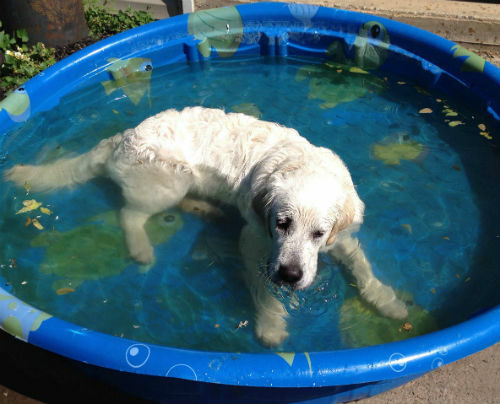 I’m attaching a photo of him in his pool–this was immediately after a walk on a hot day–he couldn’t wait to jump in!! We’ve been going on early morning walks since it’s gotten hot–some days with his pal Chester and sone days with Mom, Dad, and brother Oliver! Last week went and spent a day with his doggy cousins Balen & Meirden. 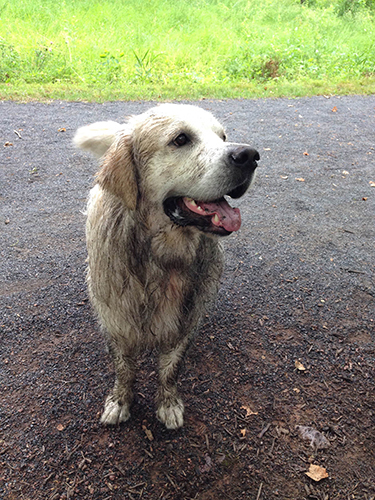 We’ve enrolled in Obedience Classes–they begin on June 22. I will give a report on his progress–but I’m sure he will excel!! He is very smart and has us all well trained–well, except for Oliver!! We just completed Adult Manners I Class. He was a star! And, that was with very little practice on our part. He’s very smart and learns very quickly! We were both remiss in practicing a lot with him and faced every class with great trepidation. He performed whatever tasks were requested, and he knows most of them with just hand signals. He was taught sit (which he already knew thanks to your previous training), down, stay, come, walk on loose lead, leave it and go to place. We intend to take another class–the trainer calls it Tricks Class, but it’s really move than that. Unfortunately, the class she has starting next doesn’t work with our schedule, so we’ll probably start one in late fall. I’m actually contemplating going through the whole challenge of having him become a Therapy Dog. We’ll see. I’ve no doubt that he is very capable–it’s just a question of whether I’ve got the commitment to follow through with all the work required. We’ve been taking pretty much daily walks. They’ve actually been good for all of us, including Oliver, our 15 year old Jack Russell. We actually go to two different parks where he can also swim. He goes with his buddy Chester once a week and they have a blast swimming and running! He LOVES the water. I think he would stay and play in the water all day!! We will be leaving for our annual 3 week trip to the Outer Banks shortly. I can hardly wait to see Bailey in the ocean and on the beach. I know he’s going to absolutely love it!! Hi, hope all is well at Icewinds!! Bailey is doing wonderful! He is such a joy. I think even Oliver, our 16 year old Jack Russell, is getting used to him. He is very respectful of Oliver’s boundaries. Bailey has been traveling with Carl. Carl currently has construction projects in Baltimore, MD, Washington, DC and two in Virginia. Bailey has been staying in hotel rooms, he’s now gotten used to using the elevators and he has attended various meetings in attorney’s offices, construction offices and been on job sites with the Navy, the Army, and the Veterans Administration. He’s become quite the famous dog!! He always behaves admirably. I guess from us bringing him to the office from the time we brought him home, he seems to understand that when he’s in an office atmosphere he must be calm and quiet. Once he comes in and greets people, he simply lies down by Carl’s side and waits patiently for the meetings to be over. I’m attaching some recent photos! His absolute joy is swimming! 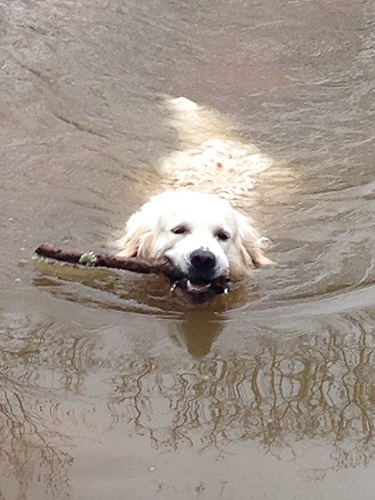 We can’t keep him out of water–if he sees it or smells it–he’s off and diving in!! We will be going back to the Outer Banks this fall and hope to get him used to the ocean this time. Two photos of Bailey swimming, one of how handsome he is as soon as he comes out of the water, and then finally him 2 minutes later after he rolls in whatever dirty, stinky thing he can find! !